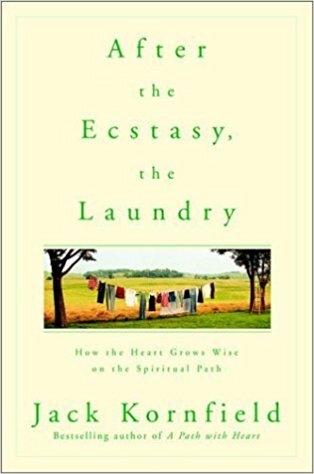 Excerpted from After the Ecstasy, the Laundry by Jack Kornfield. Copyright © 2000 by Jack Kornfield. Excerpted by permission of Bantam, a division of Random House, Inc. All rights reserved. No part of this excerpt may be reproduced or reprinted without permission in writing from the publisher. HTML and web pages copyright © by SpiritSite.com. What is it that draws a person to spiritual life? From as far back as we can remember, we can each sense a mystery in being alive. When we are present with an infant in the first moments after birth, or when the death of a loved one brushes close to us, the mystery becomes tangible. It is there when we witness a radiant sunset or find a moment's silent stillness in the flowing seasons of our days. Connecting to the sacred is perhaps our deepest need and longing. Awakening calls to us in a thousand ways. As the poet Rumi sings, "Grapes want to turn to wine." There is a pull to wholeness, to being fully alive, even when we have forgotten. The Hindus tell us that the child in the womb sings, "Do not let me forget who I am," but that the song after birth becomes, "Oh, I have forgotten already." Still, as surely as there is a voyage away, there is a journey home. Throughout the world we find stories of this journey, images of the longing to awaken, the steps along the path that we all follow, the voices that call, the intensity of the initiation we may meet, the courage we need. At the heart of each is the original sincerity of the seeker, who must honestly admit how small is our knowledge of the universe, how great the unknown. The honesty the spiritual quest requires of us is addressed in the Russian initiation tales about Baba Yaga. Baba Yaga is an old woman with a wild, haglike visage who stirs her pot and knows all things. She lives deep in the forest. When we seek her out we are frightened, for she requires us to go into the dark, to ask dangerous questions, to step outside the world of logic and comfort. When the first young seeker comes quaking up to the door of her hut, Baba Yaga demands, "Are you on your own errand or are you sent by another?" The young man, encouraged in his quest by his family, answers, "I am sent by my father." Baba Yaga promptly throws him into the pot and cooks him. The next to attempt this quest, a young woman, sees the smoldering fire and hears the cackle of Baba Yaga. Baba Yaga again demands, "Are you on your own errand or are you sent by another?" This young woman has been pulled to the woods alone to seek what she can find there. "I am on my own errand," she replies. Baba Yaga throws her in the pot and cooks her too. Later a third visitor, again a young woman, deeply confused by the world, comes to Baba Yaga's house far into the forest. She sees the smoke and knows it is dangerous. Baba Yaga confronts her, "Are you on your own errand, or are you sent by another?" This young woman answers truthfully. "In large part I'm on my own errand, but in large part I also come because of others. And in large part I have come because you are here, and because of the forest, and something I have forgotten, and in large part I know not why I come." Baba Yaga regards her for a moment and says, "You'll do," and shows her into the hut. We don't know all the reasons that propel us on a spiritual journey, but somehow our life compels us to go. Something in us knows that we are not just here to toil at our work. There is a mysterious pull to remember. What takes us out of our homes and into the dark of Baba Yaga's forest can be a combination of events. It can be a longing from childhood, or an "accidental" encounter with a spiritual book or figure. Sometimes something in us awakens when we travel to a foreign culture and the exotic world of new rhythms, fragrances, colors, and activity catapults us out of our usual sense of reality. Sometimes it is as simple as walking in the blue-green mountains or hearing choral music so beautiful it seems inspired by the gods. Sometimes it is that mysterious transformation when we attend at the bedside of the dying and a "person" vanishes from existence, leaving only a lifeless sack of flesh awaiting burial. A thousand gates open to the spirit. Whether in the brilliance of beauty or the dark woods of confusion and sorrow, a force as sure as gravity brings us back to our heart. It happens to every one of us. The most frequent entryway to the sacred is our own suffering and dissatisfaction. Countless spiritual journeys have begun in an encounter with the difficulties of life. For Western masters, suffering in early family life is a common start: alcoholic or abusive parents, grave family illness, loss of a loved relative, or cold absentee parents and warring family members all recur in many of their stories. For one wise and respected meditation master it started with isolation and disconnection. When I was a child, our family life had so much unhappiness. Everyone was yelling and I felt I didn't belong there. I felt like an alien. Then, about age nine I became really interested in flying saucers. For years at night I would fantasize that a UFO was going to pick me up, that I would be abducted and taken back to another planet. I really wanted that to escape from my alienation and loneliness. I guess that was the beginning of my four decades of spiritual search. We all know how much the heart longs for spiritual sustenance in times of difficulty. "Honor this longing," says Rumi. "Those that make you return, for whatever reason, to the spirit, be grateful to them. Worry about the others, who give you delicious comfort that keeps you from prayer." For another spiritual teacher, physician, and healer, thirty years of inner work also began with family sorrows. My parents fought terribly and then divorced quite violently when I was young. I was sent to an awful boarding school. My family life was so painful, it left me lonely, filled with grief, restlessness, and discontent with everything. I didn’t know how to live. One day I saw a man in orange robes and shaved head chanting "Hare Krishna" on the steps of the square. I naively thought he was some wise Indian saint. He told me about karma, reincanation, meditation, and the possibility of freedom. It rang true in my whole boyd. I was so excited, I phoned my mother and said, "I’m leaving school. I want to be a Hare Krishna monk." She became quite hysterical, so we compromised to where I would learn meditation. That opened me to another world. I learned to let go of my past and to have compassion for myself. Meditation saved my life. Crisis is an invitation to the spirit not only in childhood, but whenever our life passes through suffering. For many masters, the gateway to the spiritual opened when loss or desperation, suffering, or confusion drove them to look for solace of the heart, for a hidden wholeness. "We don't know all the reasons that propel us on a spiritual journey, but somehow our life compels us to go."